Stamping Through the Eyes of Karen: Yes I'm Finally back!!! So here I am. I've been taking a bit of a stamping break and enjoying the summer before it's gone! Hard to believe some kids are back at school already. 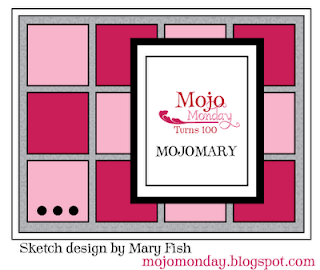 My project here is designed using the Mojo Monday 100 sketch challenge. I like using these challenges as they are usually easy layouts and it just helps me get my creativity going. Enjoy and thanks for stopping by.